In 2014, after a very long year of treatment for Stage 3 breast cancer, a 2.4cm tumour compressing my spinal cord threatened to stop me from breathing or my heart from beating. Urgent spinal cord surgery on C1 interrupted my chemotherapy. When I was able to walk assisted, I started the next three rounds. After the spinal cord surgery, my family doctor said: “When this is all over, get out of town. At least two months!” It turned out to be a life-changing decision, and the best advice ever. On a quest to heal on this two-month adventure, little did I know that the universe had a plan that would change my life. I chose Bologna, Italy. For the first ten days, I was with my daughter, Emily, during her break. Her desire for leather led us to an overnight in Florence. Emily and I booked a hotel for the night. For evening entertainment, we both were keen on a concert of Italian love arias. We arrived at the venue on time, but too late. Tickets were sold out, yet the woman checking the tickets smiled at us. “Just wait.” Miraculously, two empty seats in the front row became free because of a no-show. St. Mark’s English Church in Florence has a resident opera company with an active list of professional vocalists. There are always three singers, two concerts mid-week, and a full opera (minus the choir) on weekends. It’s a freelance gig, and well-paying. Once everyone was seated, the first piece was a soprano solo. The piano began and no sooner had the singer opened her mouth, my daughter and I had tears running down our faces. We had no idea these were professional opera artists! And they were just five or ten feet from us. A baritone, Álvaro Lozano Gutierrez, began his solo with a guitar. By the end of his song he had the entire audience singing “Figaro Figaro Figaro.” Later, Álvaro sang a duet with the soprano. When it was his turn to sing, Álvaro put his arms around her and danced her across the stage while singing, as she laughed. In fact, everyone was laughing. The audience couldn’t get enough of him. Neither could we. This artist had a sizzling energy that flooded the room – and it was exactly what I needed. Following the visit to Florence, I sent a note to Álvaro, care of the opera company. In it, I complimented him on his performance and invited him to have a drink after the next concert. During that second act of the concert, Álvaro ran across the stage, fell to his knees and slid right up to my feet. He opened his arms and sang a verse to me. It was, truly, the most incredible moment of my entire life; and the rest is a much longer story. I told my choir director, Harriet Wichin (now executive director of the Miles Nadal Jewish Community Centre), that my friend the opera singer was also a conductor. She agreed to let him guest conduct a rehearsal. That evening, Harriet received a flood of emails from the choristers. She cut and pasted the feedback. Compiled, it was six pages, single-spaced. Álvaro guest-conducted a second rehearsal, then guest-conducted Suzuki students at the MNJCC, then a community choir, then a big band called the New Horizons Band, and so on. These organizations all wanted him back. So, with the support of Harriet Wichin at the MNJCC, Álvaro and I proposed a program to bring the high art of opera into a community setting. No auditions, no note-reading, no experience required. The first session, a pilot hosted by the MNJCC, was a surprise to everyone. Over 150 singers registered. Who knew so many people wanted to sing opera? Following the second program, in collaboration with a church and a few language organizations, we formalized a not-for-profit organization, with Solomon Gómez as the general manager, called Opera For All (OFA). We performed at Koerner Hall in April 2018, followed by a summer concert at the Jane Mallett Theatre (St. Lawrence Centre for the Arts). Now we have a steadily growing group of people who are falling in love with opera. Álvaro is a world-class singer and conductor, but the reason he continues to support OFA is his passion for life. It is so easily transmitted to all of our choristers and soloists. People who think they are coming to sing, or coming to hear an opera concert, are shocked to discover that they are instead coming to join us in living life to the fullest. Whether you have forgotten what it feels like to shout your praises to the universe, or whether you never have before, OFA will make you want to! Elizabeth Abraham is a co-founder, along with Álvaro Lozano Gutiérrez and Solomon Gómez, of OFA and is currently in remission. She is a mother, a Spanish-English translator, a language access strategist and OFA singer, leading other choristers into the rabbit hole of life, from which none return the same. November 12, 2014 commemorates the one-year anniversary of Massimo Nosetti’s sudden death. He was diagnosed only one month earlier with pancreatic cancer so when the news came, shock was felt around the world. Massimo was very much in demand and performed frequent solo and orchestral concerts in many of the world’s important performance venues. He was a wonderful friend, a great organist, composer and educator. In dealing with the shock and grief of this news, there was a common theme running through all the comments that were shared among friends. Massimo was soft-spoken, courteous and unassuming. For someone with such amazing musicianship, there was never a hint of arrogance coming from him. Rather, he was humble, elegant and always understated. He was a shining example of how we should all conduct ourselves, knowing that life has a way of creating circumstances that could change everything. He was confident without being obnoxious or pretentious. To his friends and acquaintances alike, he was always supportive and gracious. For me personally, Massimo was generous with his time, his music, and his support of Organix. He was world class and at this level, he could name his price and get it. Yet for me, he always said “Don’t worry about it.” He considered me one of his friends and treated me with much love and respect. He knew the challenges facing an independent producer of organ concerts in the “new world” but encouraged me to continue. He said that it was a jewel among music festivals, and “Organix is a fantastic music box where you find a huge amount of the most beautiful and varied music for the organ.” He went on to say, “It’s a perfect organization with the possibility for the performer to present music not very often heard.” With such an endorsement, his last performance in Toronto was a magnificent concert of Rheinberger and Bossi works for organ and orchestra. This concert can be heard on the Organix website. Organix 12 presented Massimo with a 33-piece orchestra under the direction of Philip Sarabura. There was also solo trumpet and trumpet and organ with Michael Barth. All in all, that very special evening was a sparkling event, and while I had communicated with him often since then, it was the last time I saw him. What a great memory to hold! On November 12, 2014, Organix will commemorate this anniversary with a very special gala concert featuring three organists and a choir. Maxine Thévenot from Albuquerque and Eugenio Fagiani and Omar Caputi, both from Italy, will perform organ segments while the Toronto Ecumenical Chorale under my direction will perform choral music, including a premiere of a piece that I wrote and dedicated to the memory of my friend. For program details, please visit the website at organixconcerts.ca. Gordon Mansell is the president, artistic director and organist of Organix Concerts Inc. The last few years have been very exciting and busy for me in the world of music. Since first connecting with WholeNote magazine in January 2011, I can’t begin to tell you about the wonderful people I have met, musicians I have played with, and orchestras that have helped me expand my love of music. I continue to be inspired by the amazing experiences I am grateful to have: from performing on beautiful stages to fundraising for various charities and not-for-profit organizations through music; from composing original pieces of music to producing two CDs and giving a portion of the proceeds to Free The Children; and from participating in international summer music festivals to developing my own music program for rehabilitation patients (which I will tell you about a little later). I have enjoyed performing in Carnegie Hall as the gold medal winner of the American Association for the Development of the Gifted and Talented – what a gorgeous, historic hall. I also have played in many other beautiful venues such as Koerner Hall in Toronto, Isabel Bader Theatre, Walter Hall at the University of Toronto, Hamilton Place, Mississauga Living Arts Centre, George Weston Recital Hall, Metro Toronto Convention Centre, Rolston Recital Hall in Banff, Conservatoire de musique in Montreal, Vancouver Convention Centre and Convocation Hall at the University of Alberta. This past summer, I participated in the prestigious Banff Masterclass Program in addition to the Aspen Music Festival and School, where I studied with Paul Kantor. Previous summer programs included the Young Artists Program at the Summer Music Institute of the Ottawa National Arts Centre, the Banff Centre’s Strings Masterclass Program and the Summit Music Festival in Pleasantville, New York. I am currently studying with Barry Shiffman, in my eighth year as a scholarship student in the Phil and Eli Taylor Academy for Performing Artists of the Royal Conservatory of Music in Toronto. I am also studying the viola in the Academy with Eric Nowlin and the piano (Licentiate Level of the RCM) with Dianne Werner. I am always greatly inspired by my incredible teachers and I adore being in the Academy – making music with fellow colleagues, playing for world-renowned artists (such as Donald Weilerstein, Victor Danchenko, Paul Kantor, Sylvia Rosenberg, Leon Fleisher, Brian Lewis, James Ehnes, Soovin Kim and James Boyd), and developing the musical foundation knowledge with ear training, theory and music history. It really is such a nurturing environment! There is research which demonstrates the therapeutic value of music. Music and medicine go hand in hand as music creates magical moments that can calm, excite, and bring joy to those listening. Music can reach deeply inside people. It brings people together from all ages and backgrounds, activates emotions, relieves symptoms, and overall gives patients something to focus on other than their health challenges. For more than two years I have enjoyed giving very successful themed performances for patients on the rehabilitation floor at the Oakville Trafalgar Memorial Hospital. When I first began to perform at the hospital, I believed I was going to be playing background music for patients doing crafts. However, as I began to play, the patients became distracted from their crafts, in a good way; they wanted to sit and listen to the music. After a few sessions, word spread about the enjoyable music and patients began fighting for front row seats in the audience! Hearing and seeing firsthand how much the patients enjoyed the performances, I thought it would be wonderful to create a program so that other youth could do the same – the idea for Suite Melody Care was born! In the second semester of my Grade 11 year in high school, I decided to take Grade 11 online Leadership and Grade 12 online Entrepreneurship and further developed my idea – to create a venture plan, website, logo, slogan, and more for Suite Melody Care. Suite Melody Care’s purpose is to inspire youth to give back, to create positive change through music, and to bring joy to those experiencing difficult times during their recovery. As a result, Suite Melody Care will encourage talented, young musicians across the country to give back to their communities by performing in their local hospitals: taking patients on themed, musical journeys and sharing fun trivia with them. In addition, Suite Melody Care will also be available in DVD and CD formats as a product, in the near future. Positioned as a not-for-profit program for rehabilitation patients, Suite Melody Care’s target market will be patients in hospitals, their families, and their friends. People of any age can enjoy this program that brings talented, young musicians to perform for those who are unwell, in rehabilitation, or recovering from major illnesses or surgeries. My goal is to establish Suite Melody Care in hospitals first in Ontario, and then across Canada – and maybe the world?! I would like musically talented youth to be actively involved in the program. I also hope to make the Suite Melody Care DVD/CD products successful – I will be donating a portion of the proceeds of the Suite Melody Care DVD/CDs to hospitals. To all of those young aspiring musicians out there, I challenge you to take part in Suite Melody Care. By showcasing your musical talent in the community, we can raise the spirits of patients in hospitals, put smiles on their faces, assist patients in their rehabilitation and bring them musical performances to enjoy!! Contact me for more information on how to participate: ashworthproductions@gmail.com. With the time having travelled so swiftly since my first time appearing in WholeNote back in January 2011, it is exciting to think of all of the memorable opportunities I have already experienced on my musical journey. Looking into the future, I have some exciting plans – I am already planning my third CD (which will include some special and different things, including some of my own original compositions! ), linking up with another charitable organization in addition to my work with Free The Children and some more fun surprises to come! The WholeNote first crossed paths with Leslie Ashworth as one of the 2011 Toronto Sinfonietta Concerto Competition winners. Leaving a recent recital at Koerner Hall, as I passed a table devoted to The Royal Conservatory’s educational programs, my attention was caught by a colourful folded-up glossy info sheet in the form of a poster with an intriguing sentence coated in two colours under a headline which is also the headline of this article: The Benefits of Music Education. “Neuroscientists have demonstrated that learning to play an instrument or sing leads to changes in a child’s brain that make it more likely they will reach their full cognitive and academic potential,” it stated. As I read further, the message continued connecting music education to cognitive development, promising stronger connections between brain regions, more grey matter, improved brain structure and function, better memory and attention. Even a higher IQ. This was heady stuff and gratifying to behold offering further confirmation of the undeniable benefits of music on the developing brain. The cognitive benefits of music education were then broken down into IQ, Working Memory and Creativity. It was fascinating see scientific evidence of increased IQ scores among children who take music lessons compared to children in drama classes or those who did neither. Additionally, individuals who are musically trained show better working memory abilities than those who are not, something that is crucial to mental arithmetic and reading comprehension. Scientists also found a marked difference in communication between the right and left sides of the brain (which fosters creativity) in individuals with musical training than in those without. Below the text were the words Albert Einstein. Those of you who read me know I like to feign rage from time to time about certain concert behaviours that I think mess up the show for other patrons. Pet among my peeves over the years are: The Walking Ovationists, The Pre-Mature Ejaculators and the Deci-belligerent Shushers. The Walking Ovationists are of course those who leap to their feet the instant the performance is over and then with varying degrees of subtlety start a sidelong sidle for the exits (toes of their row-mates be damned). The Pre-Mature Ejaculators are the ones with such a desperate need to prove they knew the piece was over (and that it was great for them) by bellowing BRAVO! into the first micro-second of God-given silence that should be the true ending of any piece of music. The Deci-belligerent Shushers are the self-appointed guardians of the classical concert-hall’s code of silence, hissing their hatred at even the minutest muttered transgression (while somehow failing to realize that their shushes rip the listening envelope to shreds more completely than any other utterance could). Oh, I could go on and on and on! Swarming like jackals around these three are the Mid-Movement Crinkly Candy Unwrappers; the Why-The-Hell-Are-You-Here-If-You’re-That-Sick Coughers; the Balcony Texters, the Baleful Glarers … You get the picture. But there is one group you have NEVER heard me rail at in these pages: namely the people who know so little about the “rules” of concert hall behaviour that they applaud in the wrong places. And here is a story that illustrates perfectly why. 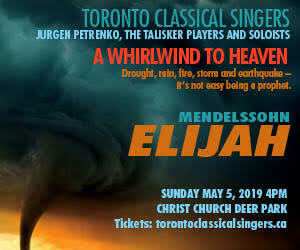 It was a performance of the Toronto Symphony Orchestra back in the spring (early May), with an audience that seemed less well-trained in concert etiquette than usual, right from the start, and proved it a few times in the first half. Peter Oundjian was conducting, and the work after intermission was to be Tchaikovsky’s Symphony No.6 “The Pathétique.” At the start of the second half, as he is affably wont to do, the Maestro stepped forward, like any good Maitre D’, to chat for a moment with the guests in his house about what was on the menu. I won’t try to replicate his words. But the gist of it went something like this: that this possibly greatest of all Tchaikovsky’s symphonies was typical in some way – four clearly defined separate movements – but that it was also atypical in some other interesting ways. Among them was that it didn’t follow the expected roadmap. Instead of the four movements following a pattern that goes fast, slower, fast-ish, fastest, Tchaikovsky’s Sixth hits its peak of fast and loud in the third movement – so much so that as an audience it’s impossible not to want to applaud. What followed was completely memorable. There was a sprinkling of quiet applause after the first movement (and no one glared at anyone else). It was quiet-ish after the second. But after the third movement, even concertgoers who would normally have sat on their hands joined the general clapping. Somehow it was as if we all knew that as much as anything we were rooting for a composer trying with every fibre of his being to give us a happy ending that was never in the cards. And after the terrible, wonderful final movement ... there was silence. A precious five to eight seconds of pure silence with a conductor literally and metaphorically holding the silence up there for us all to see and feel, in the palm of his upturned hand. No one bellowed bravo; not one person leapt to their feet. Until, precious silent seconds later, Oundjian lowered his hand and let the moment go. The audience rose to our feet to accord a special performance the concerted response it warranted for the universal feelings it had evoked. So, Maestro, a belated BRAVO, for seizing that particular moment on that particular day, in that particular way. So, what can be taken (usefully) away from this? Well, three things, I think. First, presenters have an opportunity in welcoming new audiences, to decide anew for themselves what the do’s and don’ts of their particular house should be. Third, conductors and performers have the power themselves to command the duration of the silences around and within the works they are performing, as actively as they command the notes of music between those silences. So, what do you think? I would love to hear what you all, performers and presenters and audience members alike are doing, or want to say, about all this. Teachers! Stand Out From The Crowd!